Manchester United caretaker manager Ole Gunnar Solskjaer recently spoke about what his side needs to do in order to compete with the likes of Manchester City and Liverpool for the Premier League title. Manchester United are one of the hottest teams in Europe right now, boasting a 12-game unbeaten streak in the league. The Red Devils also qualified for the quarter-finals of the UEFA Champions League, after beating Paris Saint-Germain on away goals last week (3-3 on aggregate). However, despite their success, they are still 16 and 15 points behind Manchester City and Liverpool respectively in the league table and have a lot of work to do in order to compete for the English crown. 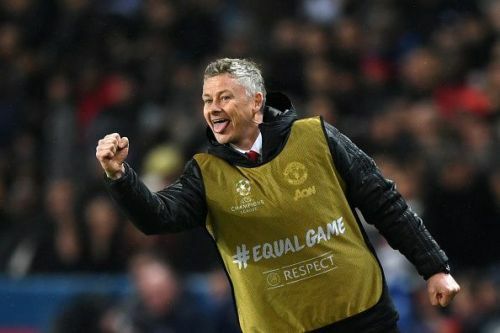 Speaking to journalists (via Manchester Evening News), Solskjaer identified the main differences between the title contenders and his team. “How many games have I been in charge? Ten? Twelve? That's just part of a season. We need more time to be challenging – but that's what this club should be doing. “I'm talking about things like total running distance – that was the highest we've ever had [against PSG]. That has to continue. There's absolutely no reason why Man United shouldn't be the hardest-working team in the league. “Ask all the players back home [at Molde]. One of the things I always demand from my players is work-rate and attitude and fitness. So we need to keep working on the fitness – and next season the players know that they will be asked if they want to challenge the top. The Norwegian also believes that Manchester City and Liverpool run more than his team. Manchester United will square off against rivals Arsenal later tonight before travelling to Wolves for a crucial FA Cup clash.